The Blockchain technology is surging high to reshape the business processes across a wide-range of industries. The demand for Blockchain Technology is increasing due to the simplified business processes with total transparency, immutability and security. The expert blockchain developers at Teplar have obtained comprehensive knowledge on blockchain technology, ready to take the financial institutions and economy forward. We have an outstanding team of highly qualified and skilled blockchain developers in the industry, who combine their expertise and knowledge to deliver world-class blockchain app development services, bringing scalability and high performance in your business. Smart contracts are virtual contracts encoded in Blockchain. It consists of a set of tasks that are self-executing nature. It can automatically keep track of the terms of an agreement and enable every step towards its fulfillment. When hosted on the Blockchain, a smart contract cannot be altered or interfered by any party, including the two agreement holders. If changes have to be made, the entire network has to be altered. A cryptocurrency is a digital currency designed to work as a medium of exchange using cryptography to secure the transactions and to control the creation of additional units of the currency. Bitcoin is the world's first decentralized cryptocurrency. It has received a huge success with an outstanding response from the worldwide communities. Decentralized applications (dApps) are software applications that run on a decentralized P2P network of computers rather than a single computer. dApps generally runs in blockchain peer-to-peer network to ensure transparency, immutability and security. A distributed ledger is a consensus of replicated, shared, and synchronized digital data geographically spread across multiple sites, countries, or institutions. There is no central administrator or centralized data storage. Hyperledger is an enterprise-grade distributed ledger based on Blockchain technology that uses smart contracts. Expert Developers at Teplar can help you to develop decentralized enterprise applications using Hyperledger - one of the top Blockchain platforms. Blockchain can solve a lot of problems faced by banks and financial organizations nowadays. Blockchain technology has huge benefits such as high level of safety in storing and transmitting data, open and transparent network infrastructure, decentralization and low cost of operations. The potential for blockchain technology to disrupt the insurance industry and change the way we share data, process claims and prevent fraud is intriguing, but we're still in the very early days of its exploration and implementation—on the radar of innovative insurance industry pioneers but not close to widescale adoption. Blockchain technology has the potential to transform health care industry, placing the patient at the center of the health care ecosystem and increasing the security, privacy, and interoperability of health data. This technology could provide a new model for Health Information Exchanges (HIE) by making electronic medical records more efficient, disintermediated and secure. Blockchain accelerator manages the change of property ownership, in other words the transfer of ownership of any digital or physical asset (e.g. vehicles, equity, houses, etc.). 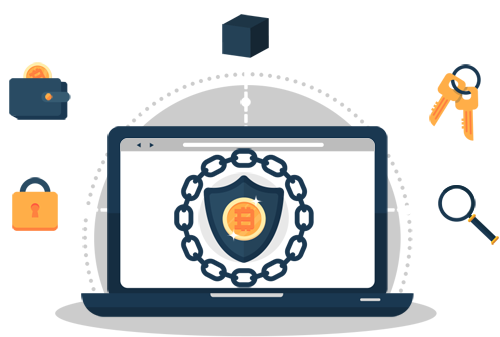 Through the registration of a transaction in the Blockchain register, the identity of the seller and the buyer, the unique identifier of the asset and the time stamp associated with the transaction are guaranteed and cannot be modified. Here at Teplar, we have some of the best blockchain developers in the industry on our team, who will respond quickly and professionally to your needs, and provide you with ongoing support for all of our services. Why TEPLAR for Blockchain Development? Using Cutting-edge development strategies and methodologies ensures your blockchain application to work smoothly. Using software development techniques to provide more reliable, secured and cost-effective blockchain solutions to our clients. We are always online and ready to assist about blockchain-based decentralized applications (DApps) for businesses and entrepreneurs. Our planned and working models delivers high quality blockchain applications to businesses and entrepreneurs.